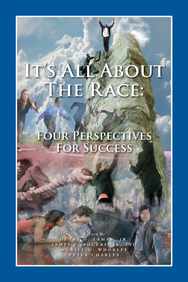 It’s All About the Race — it took us almost as long to come up with the title as it took us to write the “hip pocket” book, but in the end, this book provides an introspective peek into the psyche of four successful business people who met and overcame the challenges that minorities face in the workplace. This book is a realistic approach to working through those challenges. It is our hope that you can use our experiences to avoid the pitfalls that many minorities face as they struggle to be accepted and valued in the business world. We are convinced that, after reading this book, you will realize that an intense work ethic, faith, honesty, perseverance, self-value, and “commitment to right” will always steer you in the right direction.